From a Blue Saints press release Blue Saints introduce two new staff members for the 2007 season: Chad Ellis, visual and brass staff and Micheal Sanchez, color guard caption head. 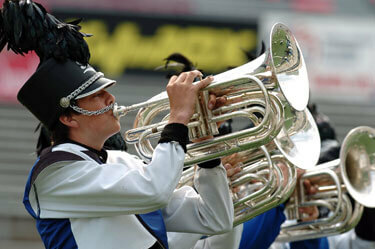 2006 DCI World Championships in Madison, Wis.
Ellis, a Florida native, was a member of Teal Sound from 2003-2005. He wrapped up his drum career with the Crossmen in 2006. He has served as a staff member for several high school marching programs. Sanchez has been an active instructor, choreographer, drill writer and adjudicator for 12 years. He has worked with dozens of high school and university programs in Texas and Northeast Oklahoma. Sanchez was a member of the Troopers in 1995 and 1998. He is currently the color guard coordinator for Catoosa Public Schools in Tulsa, Okla., where he also serves as a percussion adjunct. "Bringing Chad and Michael to the corps will be an invaluable asset to the members while bringing the program to yet another level," said Blue Saints director Mark Ripley. "We are looking forward to improving upon last season's performance and giving the audience another memorable show for 2007."